HTML means HyperText Markup Language is a computer language used to create web pages and web applications. The web browsers like Mozilla, chrome, internet explore etc.. received only HTML written documents from a web server and displayed in-front of viewer in terms of webpages. Actually this webpages contain HTML codes because the web browser understand only HTML codes. 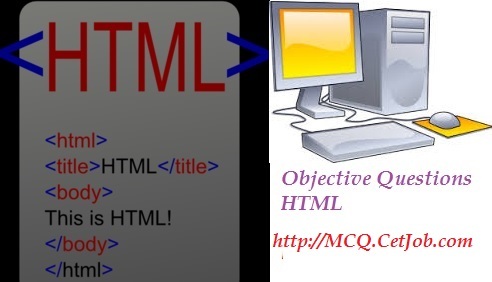 HyperText Markup Language (HTML) used CSS and Java script for making worthful content for WWW. With the help of HTML coding we can construct images, interactive forms, structured documents, heading, paragraphs, hyperlinks, tags , bracket etc for webpages. For each and every HTML elements HTML has unique codes. 1. A webpage displays a picture. What tag was used to display that picture? 2. tag makes the enclosed text bold. What is other tag to make text bold? 3. Tags and test that are not directly displayed on the page are written in _____ section. 4. Which tag inserts a line horizontally on your web page? 5. What should be the first tag in any HTML document? 6. Which tag allows you to add a row in a table? 7. How can you make a bulleted list? 8. How can you make a numbered list? 9. How can you make an e-mail link? 10. What is the correct HTML for making a hyperlink? 12. Choose the correct HTML tag to make a text bold? 13. What is the correct HTML for adding a background color? 14. Choose the correct HTML tag for the smallest size heading? 15. What is the correct HTML tag for inserting a line break? 16. What doesvlink attribute mean? 17. Which attribute is used to name an element uniquely? 18. Which tag creates a check box for a form in HTML? 19. To create a combo box (drop down box) which tag will you use? 20. Which of the following is not a pair tag?